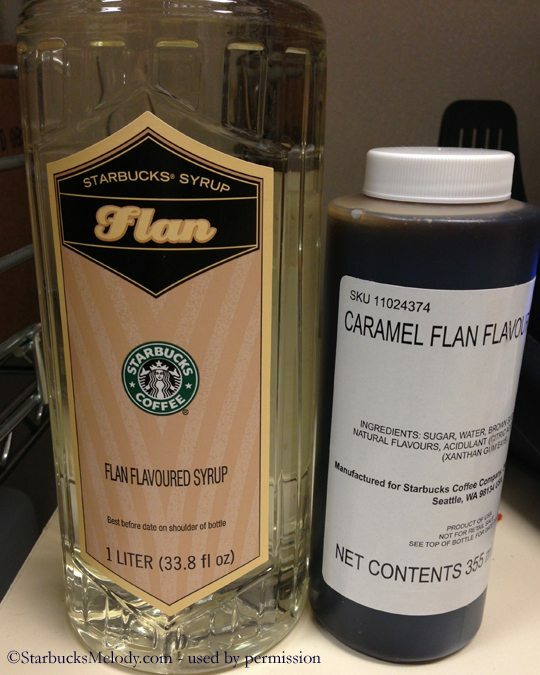 Starbucks tests the Caramel Flan Latte. Have you tried it? Starting with the new promo launch on January 3, 2013, Starbucks is offering the Caramel Flan Latte in a limited number of stores. This is a “test” item. I’m sure that many of my readers know that I love writing about “test” beverages. Keep in mind, Starbucks tests many more products than they actually launch nationally. 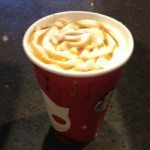 The Caramel Flan Latte is currently being offered in some areas of San Diego, California, as well as some Starbucks districts in Wisconsin. I have heard that there are a few stores in the Bay Area of California that have this drink too. Does your store have it? This drink can be made as both a hot latte, or as a Frappuccino too. It uses a caramel whip cream (the Starbucks whip cream with added caramel syrup), and a special ‘flan’ syrup and sauce. The flan sauce is used as a drizzle that tops off the drink. I have been told that it is supposed to be made with a caramel whip cream, however when I went looking for photos of beverages for this blog, mostly I saw the regular whip cream on it. It seems that some stores are just skipping the caramel whip cream. 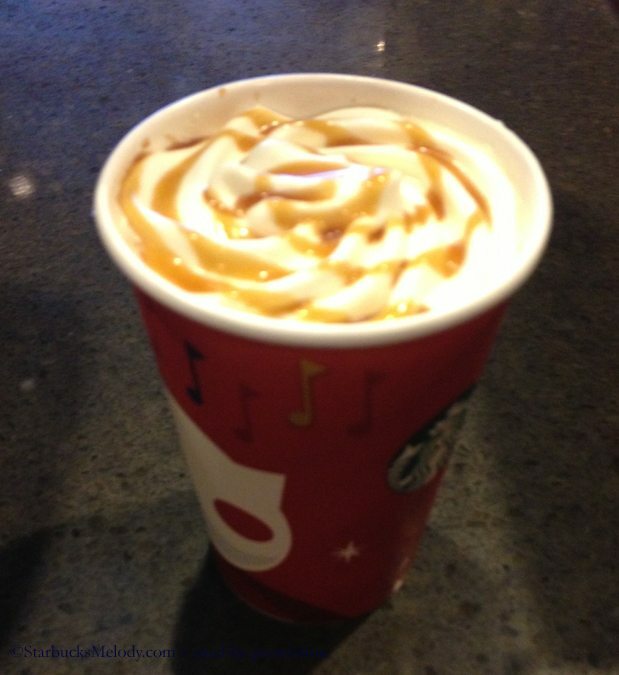 Have you tried the Caramel Flan Latte? What did you think of it? If you want to read about some previous “test” items that Starbucks has experimented with, browse through the Starbucks test products category. It is an interesting topic. For example, the Starbucks Frozt went through a couple of different rounds of testing, but apparently has been axed. There hasn’t been any recent news on the Frozt for a while. Thank you to the several people who emailed me with photos. I appreciate the tips! If you have a story idea, a proposal for a guest blog article, or photos that you want to share, email me at Melody at StarbucksMelody dot com. 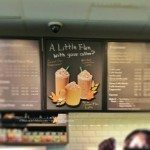 Little interactions: Snippets of Melody's Starbucks visits. Up for discussion: Is your Starbucks offering Decaf Iced Coffee? Single Origin Espresso Test at Starbucks. Try Colombia in your Latte! Isn’t it odd how these new syrups have the old logo on them? Wow! I love Caramel! When I do my drinks I mostly add Caramel whereever I can…it’s addictive. 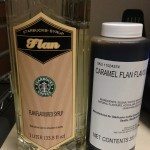 What exactly does “flan” mean in this particular drink? I don’t get it…translators give me different synonyms for “flan”, like “cake” or “pudding”. What fits best here? @Sebastian – I had actually wondered if by chance this had been an international beverage at one time. 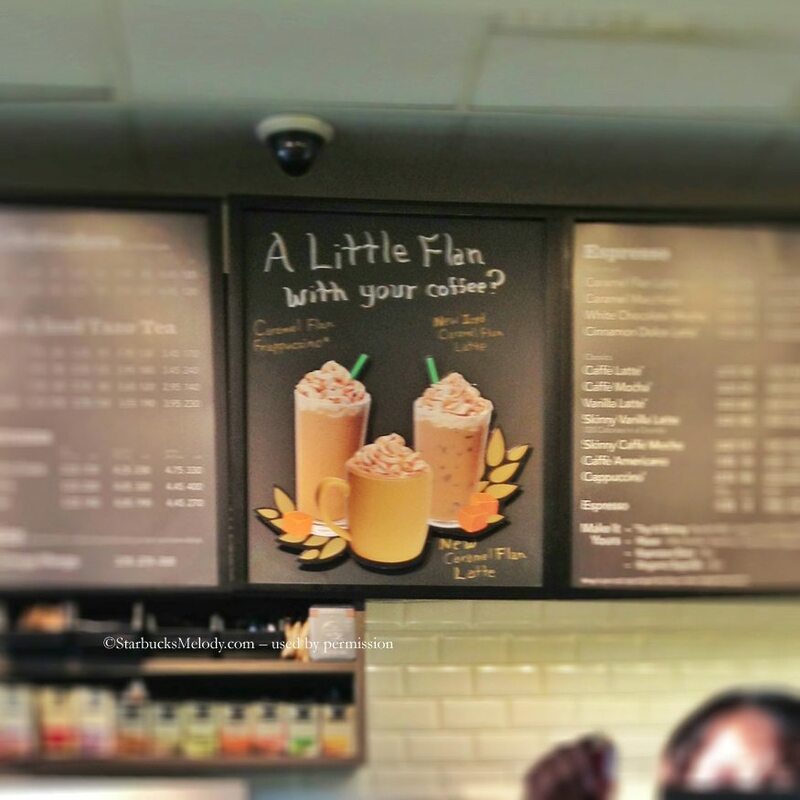 Sometimes U.S. test items were previous international drinks – Starbucks did that with the Apple Crumble Latte. Flan is like a custard or pudding (but a pudding would be softer in texture). And I have a bit of difficulty imagining exactly what this drink is like. I have to assume the flavor is sweet and buttery, like a flan. Oh no, now MSI is going to get hot with “Make Caramel Whipped Cream Permanent and Sugar Free” ideas. I wonder if this is going to very sweet, like most flan recipes are. I wish it was near here, i love flan! I must say (off topic) the new tazo tea tins are lovely. flan is a custard-style dessert, usually. it can be very yummy, or very terrible if done wrong. as for caramel whipped cream, that’s easy. when i was working for the licensed store (long long ago), we made whipped cream by putting whipping cream and 6 pumps vanilla syrup in a canister, and nitroing it. sub some caramel syrup, and you’re good to go! I don’t like flan or eggnog, but since both have eggs and milk, couldn’t they have just warmed up eggnog, and topped it with whipped cream and caramel and called it a day? There is such a thing as eggnog flan, so I was guessing they taste the same anyway. No? On second thought…. Disregard the last comment. If I posted that idea at msi, it would deliberately get voted down. I tried both the latte and frapp. DELICIOUS. I love flan. And no. No you can’t compare eggnog to flan. I hope they keep it! I just tried the iced latte and it was gone in a few min. This could be truly addictive. It tasted very much like flan, even with the sauce that spills over the sides of the flan. The only negative is that it was more like flavored milk then coffee as I could hardly detect any coffee flavor which actually kind of makes sense. I really want to try the hot version now. And I agree, eggnog and flan are not similar at all. The funny thing about the “flan” drink is they could totally remarket it as Creme Brulee becuase that’s what I really tasted on my first sip, that browned sugar flavor which is of course similar in taste to the flan sauce. Yum! Starbucks 1st advertised this drink on their Facebook page, in both Spanish & English, but mentioned nothing at all about it being a test drink that was only available in certain area/s. I got my hopes up, asked every Starbucks I went to about it, only to get a weird look followed by a “sorry, a what? Never heard of it…” in response. This went on for weeks, until I read a newer post stating the drink’s availability status. I was really looking forward to trying it (here in Northern Cali, Bay Area), especially since I was missing Caramel Brûlée Latte already & was hoping Caramel Flan would be a similar taste & decent substitution (until next year’s return of CB). Now, I can only hope it was successful, so they would offer it at all Starbucks, giving everybody a fair chance to try it. In the meantime, I discovered adding a little Toffee-Nut syrup (1pump in a Tall/Grande, 2 for Venti) to my usual Caramel Macchiato (in addition to the Vanilla that comes in it) makes it actually taste very much like a Caramel Brûlée Latte! All it’s missing is the CB topping- which although was a nice touch, but not really necessary for the end result/taste. I had a Flan Latte in Aruba last week and it was delicious! I really hope they make it a nation wide menu item. I went to Starbucks during the launch of this new drink. I was all excited to get a Carmel Brûlée latte but, they were all out so my barista suggested the Carmel Flan… It was surprisingly tasty, very sweet but similar to the seasonal Brûlée. I would defiantly order this again and I have actually. I would also suggest it to a sweet drink lover! Had it on vacation in Puerto Rico. It’s delicious. Had this caramel flan in Puerto Rico and LOVED IT! I had both the latte and the frap in Rio de Janeiro this weekend. Both are great, but the frap was by far my fav! The reason the whipped cream doesnt look any different is because the caramel syrup doesn’t add any more than the vanilla syrup. See, our whipped cream recipe is 2 ounces of vanilla syrup, 16 ounces of heavy cream, C02 and some vigorous shaking. The caramel syrup and the vanilla syrup have about the same coloration. So they arent going to make different looking whipped cream. But it’ll taste different. 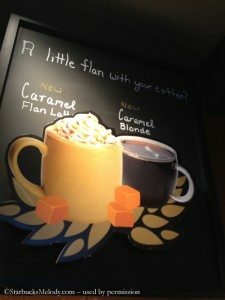 I’ve heard some gossip that this Caramel Flan beverage will be a national seasonal beverage starting in 2014 – Anyone else heard this? I’m taking Melody that you tried it while in CA. I’ve tasted the Caramel Brulee and <3 it! I thought of flan when I first tasted it. I'd love it if they release the actual Flan Latte as another holiday drink. I'm hoping it makes the circles up in Seattle so I can try it too 😀 I can't believe how excited I am. Me and my cold and I'm all "I NEED FLAN COFFEE!!!" hahaha. Not sure about the caramel whip but the flan syrup latte tastes NASTYYYYY. We were taste testing it while our store weren’t busy and boy… It leaves a gross aftertaste as well. I’m pretty sure all the Barnes & Noble Cafe’s (they all serve Starbucks coffee) in the Dallas Ft. Worth Area, if not everywhere will have the Flan drink starting this week which probably means all the actual starbucks’ will have them too. We taste tested this at the Starbucks where I work at. The flan syrup straight up smells like buttered popcorn. The latte leaves an oily after taste of butter as well. Perhaps it tastes better with the caramel whipped cream and drizzle? This drink is kind of an acquired taste. I wouldn’t want to drink a whole cup of this. Not really my thing. I just got the Carmel flan frappe in Alabama and it’s great! It’s not as sweet as the regular Carmel frappe. It is also available in the DFW area of Texas. It is DELICIOUS!!! Not real sweet, only a hint of Caramel. I love all the Caramel drinks. Disappointed that the Caramel Brulee Latte is already gone but this is a nice replacement. Maybe the iced or frappe version is better though, who knows! Sometimes I find it easier to pick up on the taste when my drink is iced. I love caramel and the Caramel Macchiato. I love Flan so that this would be good. It was horrible! There is more flavor in a watered down gas station drink than this was. I don’t know if it was the barista or it is just that bad in general. Either way I won’t get it again. The caramel cappuccino or latte at Dunkin Donuts is far surpasses this and you can taste the caramel. My absolute favorite drink at Starbucks!!!! So smooth and taste is perfect! This latte was a total waste of 5 dollars. It tastes vaguely like caramel with a peppery after taste. Like the Caramel Brulee (that tastes just like a caramel latte)- the Flan latte is nothing to write home about, and even worse with the taste of pepper. This is a miss. The Caramel Flan Latte has become my new go to drink. Since it came out – it’s what I order, always! I LOVE it! I have it as an iced latte with extra caramel drizzle One funny thing that usually happens when I order this drink though, is they give me a frappuccino instead of a latte. My guess is the “F” tips up the barista. I’m super thrilled it’s still on the menu!! I only ocassionally visited Starbucks for a vanilla steamer until I tried a Caramel Flan latte and I became addicted drinking 1-2 a day! Pleaseeeeee bring it back!